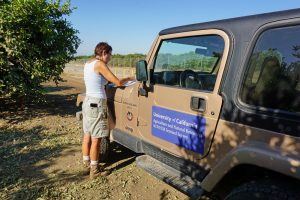 Joanne O’Sullivan is one of the scouts hired by UC to search for and collect Asian citrus psyllids. 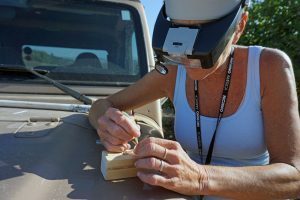 With two magnifying loops around her neck and a truck stocked with vials and tools for insect collection, Joanne O’Sullivan scouts Ventura County citrus orchards every day. She walks the perimeter, examining newly emerging leaves and tapping branches with a PVC wand to bat pests onto her clipboard. 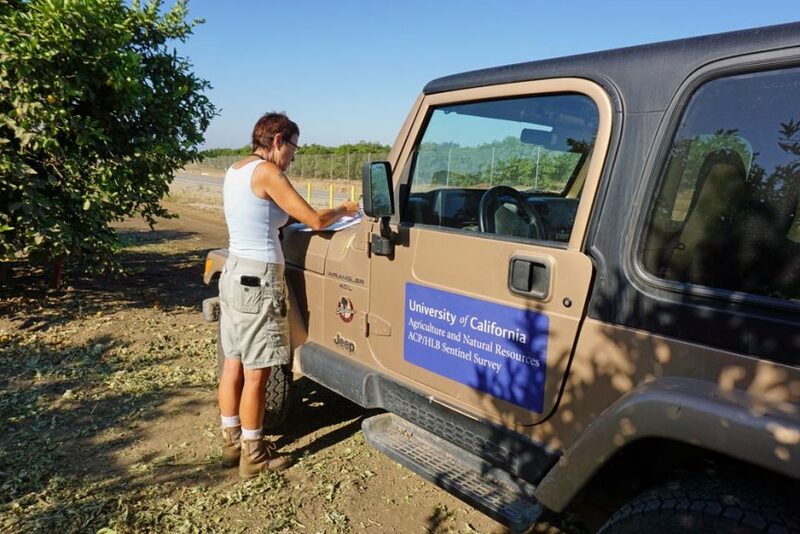 O’Sullivan is one of four scouts hired and trained by UC Agriculture and Natural Resources scientists to carefully and continuously monitor citrus orchards for Asian citrus psyllid, an invasive pest in California that can spread the devastating huanglongbing disease. In Florida, where the pest was left unchecked when it first invaded citrus growing regions, the disease swept through the state. Citrus production in the Sunshine State plummeted 60 percent in 15 years. “We don’t want to let that happen here,” said Beth Grafton-Cardwell, UC Cooperative Extension entomology specialist. 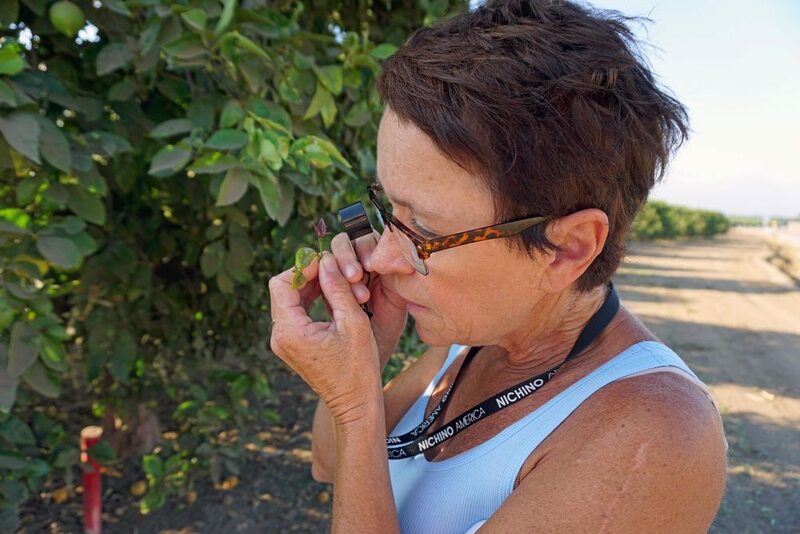 Grafton-Cardwell hired O’Sullivan and her colleagues who monitor citrus in San Diego, Imperial, Riverside, and San Bernardino counties to scour dozens of orchards to document how treatments to control ACP are working. Next year scouts will be added in Tulare and Kern counties. When ACP are found, they are carefully bottled and sent to the lab to determine whether they carry the bacterium that causes huanglongbing disease. O’Sullivan taps branches with a PVC wand to knock off insects. The expansive ACP monitoring effort is funded by a $1.45 million multi-agency coordination grant from the USDA. The project funds promising tools and long-term solutions to reduce the spread of huanglongbing. Led by Neil McRoberts, a professor of plant pathology at UC Davis, the grant also provides funds for two other activities. One is a collaboration with California Citrus Mutual to offer free citrus tree removal to homeowners in areas where HLB is known to occur. The second is modeling data from the CDFA HLB survey program, in which psyllids and symptomatic plant tissue are tested for the bacteria. Trees may have the disease but not show symptoms, so testing the psyllids is a more effective way to find infected trees. The modeling work will improve the ability to predict the locations of infected trees. However, the main thrust is monitoring citrus treatments and their impacts on the ACP population with a team of scouts. A mix of conventional and organic farmers and growers who use biological integrated pest management programs to manage their orchards were recruited for the project. The farmers make ACP treatment decisions informed by research results that show the best treatments and timing. If she finds ACP, O’Sullivan places them in vials to be sent to a lab for testing to determine whether they are carrying the bacterium that causes huanglongbing disease. “Most growers are coordinating their treatments to get a bigger bang for their buck,” Grafton-Cardwell said. With just six months of data, the monitoring program has already yielded important information about Asian citrus psyllid. This will reduce costs and the impact of pesticides on natural enemies. 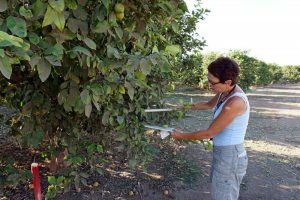 “The early data have also revealed which chemicals are the most effective for psyllid control. We’ve found that organic growers need to be more aggressive in the frequency of treatments, because the organic insecticides are not as effective as conventional insecticides,” she said. At 8 of the 49 Ventura County ranches in the project, yellow sticky traps were placed in trees to monitor for ACP’s natural enemies, including lady bugs, green lacewings, and Tamorixia radiata, tiny wasps from Pakistan that were released in California to battle ACP. O’Sullivan spends her days looking for ACP and rooting for natural enemies that can help control them. When O’Sullivan sees one of the natural enemies at work in the field, she pauses to observe the process. “Sometimes I’ll see a lacewing munching on an ACP and I’ll say, ‘Go man, go! '” O’Sullivan said.